Capacity-Building Volunteer: provides significant operational or administrative support, or developed an innovative approach to improve an existing program. Civic Volunteer: outstanding representative of a civic, membership, faith-based, or non-corporate group volunteering for a specific cause. Corporate Volunteer: an employee with above average participation and impact within an employee volunteer program. Youth and Adult - Direct Service Volunteer: individual contributing significant volunteer time, energy, and/or resources to help an agency’s constituents. Volunteer East Tennessee is a coordinating agency for the statewide initiative, Governor's Volunteer Stars Awards, which recognizes outstanding volunteers from each of Tennessee's 95 counties, at the state level. Awards are given to one outstanding youth and one outstanding adult volunteer in each county at a reception in Nashville. 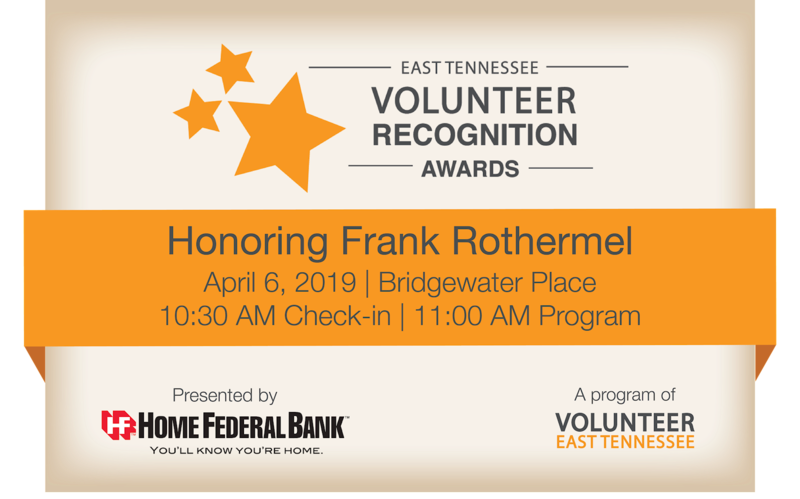 We created the East Tennessee Volunteer Recognition Awards so that all nominees from East Tennessee could be recognized and share that honor with loved ones, members of their community, and the organizations they serve. Not all nominees can afford or have the time to make the trip to Nashville. Volunteer East Tennessee felt strongly that our regional nominees deserved to be honored for their volunteerism, at home in East Tennessee.